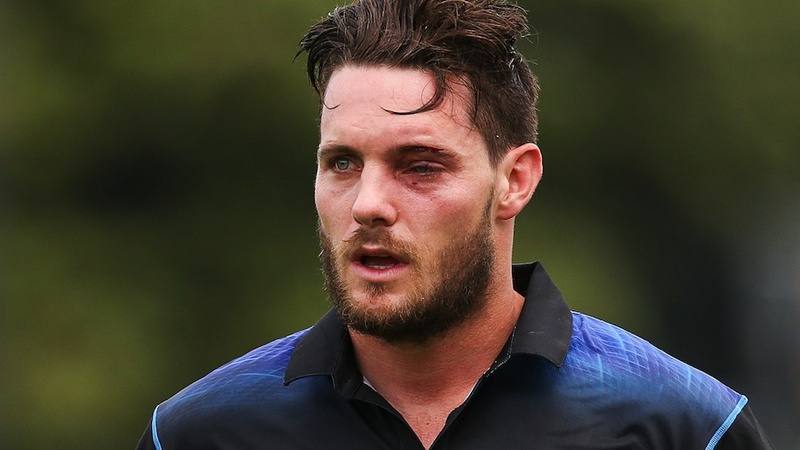 New Zealand fast bowler Mitchell McClenaghan has been ruled out of the forthcoming one-day series against Australia, after the fracture above his left eye was diagnosed to be more serious than initially thought. "It's certainly going to take at least a couple of weeks for him to recover," coach Mike Hesson said. "It appears that the fracture is a little worse than first thought. Hopefully he will be available for selection for the World T20. He has done really well for us in the T20s." McClenaghan will undergo cosmetic surgery today, though New Zealand Cricket had initially said it would take place on Friday. "It's a concern when anyone has an operation," Hesson said. "We're confident that Mitch is in good hands." The fracture had been sustained during the final over of New Zealand's innings on Monday. He was batting on 31 from 17 when the penultimate ball of the innings - from Anwar Ali - squeezed between the visor of his helmet and its grille to strike him flush on the left eye. McClenaghan was floored by the blow, and was seen bleeding from the eyebrow, but he walked off the field. He also received stitches above his eye in hospital that evening. New Zealand play three ODIs against Australia between February 3 and February 8. A two-Test series follows, but McClenaghan has not recently been a part of the Test squad. The World T20 begins on March 8 but New Zealand's first game is only on March 15, in what is officially the second round of the tournament after a qualifying first round.